Below we have included a lot of information about the Denture services that Heritage Dental Group specialises in. Please click on the dropdowns for more information. Complete dentures replace all of your natural teeth from the upper and lower gums. If there are any teeth remaining, they are usually kept to give the full denture more stability. The comfort of complete dentures depends on muscle, bones, tongue, and saliva. You’ll typically begin wearing conventional dentures after your gums heal following tooth extraction. You can also have full upper and/or lower dentures. These are also known as “full” dentures. Partial dentures are designed for patients with one or more teeth missing, but not in need of full dentures. Partial dentures are usually more secure that full dentures, since they are physically held in place by clasps designed to fit over the natural teeth. Partials can be constructed in acrylic or with metal framework. There are a number of factors that influence the type of partial design that would be appropriate and this should be discussed with your Denture Provider. Surgical dentures are made before the extraction of the existing natural teeth and inserted immediately after the extractions. Immediate dentures allow the patient to adapt to the dentures right away and to avoid the embarrassment of not having any teeth during the healing period. The dentures can also help to control the bleeding and swelling following surgery. 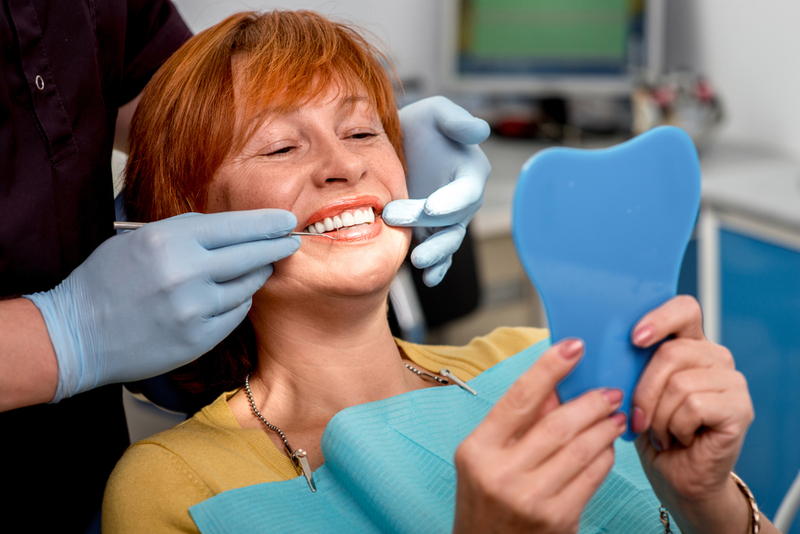 The gums continue to shrink during the healing period – usually about six months, during this time temporary liners can, if necessary, be used to help maintain the fit of the denture. When the gums have stopped changing, the immediate denture will need a permanent reline (refer Relines and Soft Liners) to ensure a proper fit and provide a hygienic surface for the denture. Sometimes the denture teeth will have to be reset if excessive amounts of tissue change have occurred. An implant borne prosthesis requires surgical placement of titanium implants into the ridges by a dentist or oral surgeon. A new implant retained prosthesis is fabricated following the healing phase to allow time for the implant to integrate with the bone. The mechanical locking action between the implant and the prosthesis results in more secure and stable fitting appliance. Implants are used more often to help stabilize the lower denture and allows the wearer to eat with greater comfort and confidence compared to conventional dentures. New mini-implants are being developed that will allow immediate placing of the new denture. It is important to realise that dentures are Acrylic (plastic), and although they are made of very strong acrylic, are not unbreakable. Fracturing can and will happen if the situation presents. No Denture Provider can assure or guarantee against this unfortunate occurrence. It must always be understood that the best plastics made have been known to break. Fortunately there are special acrylics available these days that have been specifically developed so that repairs can be done quickly – usually on the same day. For those of you who have worn dentures for many years relining a denture may be a procedure you are familiar with.Reline procedures have evolved, and sometimes what you have your denture lined with can be as important as when. First lets deal with what is a reline, and why is it done? The bony ridges that support your dentures are in a constant state of resorption (shrinking). This starts from the day you have your natural teeth extracted, and continues for the rest of your natural life. This bone loss happens at different rates from person to person, but for most, it is a measurable change every two to five years. As this change occurs dentures become looser. Symptoms are: less stability when chewing, food getting under plates, and more frequent sore spots are common indications change has taken place. Some patients experience no noticeable symptoms at all, but never the less that shrinkage factor is happening. Ill-fitting dentures left unchecked can lead to more rapid loss of ridge, making it more difficult for patients to wear dentures in later years. This is where a reline comes in. By taking an impression inside the old denture a new record of your ridges can be obtained. The fitting surfaces of your dentures are removed and rebuilt using the new records of your ridges. When the denture is returned and refitted the result is an accurate fit, much like a brand new denture. It should be noted, dentures going through this process must still have proper bite alignment for relining to be successful. A simple examination by your Denture Provider will determine if your dentures is reline able. Patients who suffer chronic discomfort wearing lower dentures will sometimes benefit from a layer of soft compressible material between their oral tissue, (gum) and acrylic denture base. This layer acts much like a shock absorber and can increase patient comfort dramatically. The more common types, can be put in at the time of construction, or relined into an existing lower denture. The average life span of these linings ranges from two to four years. Whether you choose a soft or a hard base, relines are an excellent way to keep your dentures working well, while protecting your ridges from premature resorption. Eating will take practice, especially for the first time denture wearers. Start with softer foods cut into small pieces to help develop a “feel” for chewing with dentures. It can sometimes take 6 to10 weeks to adjust to new dentures. Patients that experience a lot of tipping or movement of their dentures during chewing should talk to their Denture Provider. With all the options available for ensuring a proper fit, there is no reason that you cannot enjoy a normal balanced and varied diet without discomfort or embarrassment. Pronouncing certain words can require practice. Reading out loud and repeating difficult words will help in overcome any minor speech problems. Your tongue and the muscle in the floor of the mouth require time and practice to adapt to any changes in tooth positioning and extensions that have been made with the new dentures. If the speech difficulties persist, consult your Denture Provider. Dentures are made to fit and normally do not require the use of any type of adhesive. In an emergency, denture adhesives can be used to help keep the denture stable until you are able to see your Denture Provider. Sometimes prolonged use of adhesives can lead to gum irritation and eventual, increased bone loss in the jaws. A poorly fitting denture which causes constant irritation over a long period and can cause permanent tissue changes and even compromise the fit of any replacement dentures. If your dentures begin to feel loose, or cause pronounced discomfort, see your Denture Provider immediately. Dentures need to be checked on a regular basis, it is normal to have a check-up every two or three years. Have your dentures replaced or relined as needed, since the gums change naturally with age. This process of change is accelerated if you continue to wear ill-fitting dentures. Shrinkage of the gums can cause the dentures to align differently and/or fit less securely. Dentures that don’t fit properly can lead to chronic sores and undesirable changes in the gums. A denture with worn teeth may result in chewing difficulties, changes in facial features and in some cases, TMJ dysfunction. It’s important to reline/replace worn or poorly fitting dentures before they cause any major problems. Check-ups help ensure that your dentures last longer, function at their best and most importantly ensure the continuing good health of your gums. As a denture wearer, it is up to you to ensure that your dentures are always fitting properly to help minimize bone loss. Excessive bone loss or tissue damage caused by an ill-fitting denture can affect the fit of your new dentures and in some cases this may require surgical treatment before being fitted with a new denture.